So you want to carve out space in your home to work, think, and create, but try as you might, there doesn’t seem to be any room for an office or a workspace? Creating some personal space doesn’t have to require a home addition or a change of address. Sometimes you just need to reimagine the space you already have. Begin your search by considering an underused area. Often, homeowners with formal dining rooms rarely use them. If that applies to you, why not convert that space into a dedicated office? Or, many homes have both a family room and a more formal living room (or “sitting room”). This is especially true of older and historic homes. The perfect solution may involve converting the least-used room into an office, or even two offices, if you and your roommate or spouse both work from home. Not everyone considers the space under a staircase suitable only for Harry Potter. Leaving that space open (no doors) and adding task lighting can create a wonderful work nook in that under-utilized, under-stair space. If you don’t want to be UNDER the stairs, consider establishing your office space beside the stairs. Creating a desk that mimics the structural lines of the stairs can result in a beautiful functional office option. 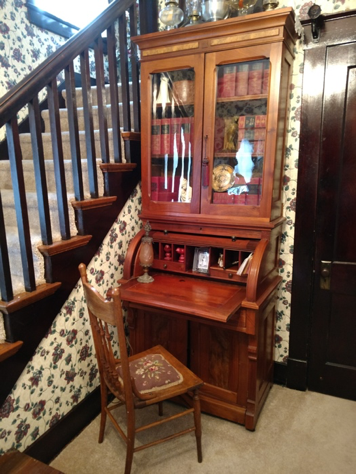 In this foyer, there is just enough room for a towering secretary against one narrow wall to create a little desk surface, plus shelving for reference materials above the desk, and hidden storage space below to keep everything neat. This would work as a writing nook, is the perfect size for a laptop (with space left over for a wireless mouse), and would be great for planning, journaling, or managing correspondence. Hallways and other unused walls can offer unexpected room for a desk of the right size and shape. All you need is three or four feet of wall space. You can also dedicate one end of the upstairs landing to use as an office. This space is seldom used productively and a beautiful office area may be just what it needs! Even art that is attached to a solid board—and hinged to the wall at the bottom with a latch at the top—can make an unexpected drop-down style workspace anywhere. Add a comfortable chair on one side, and a cabinet or shelf on the other, and you have a quickly convertible creative workspace. Have an oversized closet? GREAT! If you aren’t currently using it—or aren’t using it efficiently—consider moving your clothing into a free-standing wardrobe, and claiming the closet as a micro-office. Just be sure you’ll have great lighting and a comfortable chair. Add a small desk (or build one in) and use the existing storage shelves (or add what you need). This will create a workspace that’s private, with a door to close, when you need uninterrupted time to work. Your closet doesn’t even need to be oversized. You can use a standard or even smallish closet to create a workspace that hides away when not in use. How? Create a desk surface (using sturdy shelving brackets and a beautiful slab of wood) that spans the width and depth of the space. Add task lighting and shelves on the left and right. Put cubbies above the surface or add a layer of cork tile to have a great space for mind-mapping, brainstorming, or a place to keep important notes. If you like to spread your work across multiple screens, hang a monitor (or two) on the back wall of the closet using an adjustable mount and install a keyboard drawer and mouse shelf to use when needed. Telescoping workspaces will make a closet office seem larger, will provide a more efficient use of space, and will “fold up” to close the door. Many people find that working in a small space is comforting, even cozy, but it’s not for everyone. If a closet office seems a bit claustrophobic, you can expand the feeling of space by adding a mural, especially of an outside scene, or even by hanging a large picture or photo of a favorite landscape on the back wall. Lighting really matters in smaller work areas, so spend a little extra time, effort, and money on your lighting. Consider a lamp with a natural light spectrum to improve your mood and your work. Need Daylight and a View? Can’t stand the thought of working while facing a wall? Claim a picture window as your own and let the light shine in! Consider a custom desk or sectional unit to turn your picture window a fantastic office. Adding a narrow desk area in front of the largest window in the house can improve your eye health if you are doing detail work, or if you are glued to a screen for much of your workday. Occasionally shifting your visual focus to the scene outside your window will give your eyes a much needed break. If your view isn’t great, consider adding a bird feeder, or a pot or two of hanging flowers, to provide a focal point beyond your desk. Be sure to select a window that doesn’t have direct sunlight streaming in. You won’t find productivity in a spot that leaves you blinded by the light. If you work on a computer, you will also want to be sure there isn’t light behind you that will reflect on your screen, making it difficult to see. Having your “office” in plain view means you will have to take extra steps to keep your supplies tucked away—and locked, if you have files or equipment that needs to stay clear of toddler’s hands or a roommate’s curious eyes. If you claim a space in front of a large window in a living area, you will have to arrange your schedule and “train” members of your family to respect your work time, but it can be done. You may have a porch, or a section of a porch, that can be glassed in to create a wonderful workspace, bringing the outdoors in and placing you in a wonderfully inspiring workspace. Even if you have regular working space “inside,” you may want to consider relocating to the porch when weather permits, just for a change of (s)pace. Even a balcony office (in good weather) can be a beautiful and productive place to work. If your work is craft-based, consider using a tote to easily shift from your regular workspace to your outside space. If your work revolves around a laptop, all you need is a flat surface, a comfortable chair, and rock-solid wireless internet. Sure, it’s nice to have a guest room, but if you are working from home, having a room that’s used a few times a year seems less important than having a place to work every day. Consider installing a wall unit that contains a Murphy bed. Look for one that includes a bed plus storage space. You’ll have plenty of room to do your daily work and on those rare occasions when you need a guest room, you can move a chair or two, lock a few drawers and pull down the bed. Presto! Guest room! If you don’t have a guest room, but you do have a large bedroom, consider doing the reverse: Make a fold-away office in your bedroom. Look at your home with fresh eyes and envision all the possibilities. No matter how small your living space may be, or how full of people your home may seem, a little creativity will go a long way toward finding a workspace that works for you!